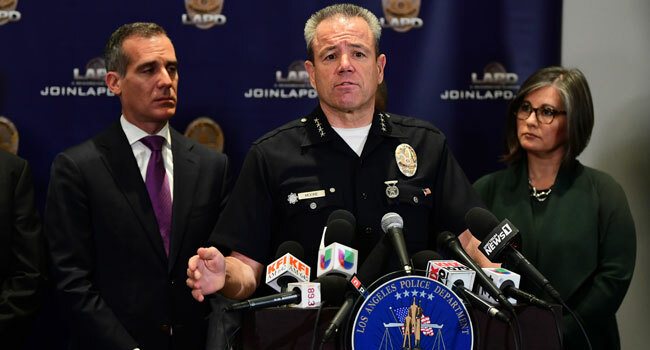 Los Angeles Mayor Eric Garcetti (L) listens as Los Angeles Police Department (LAPD) Chief Michael Moore addresses the media at LAPD Headquarters on April 2, 2019, in Los Angeles, California as a suspect has been named and is sought in the murder of Rapper Nipsey Hussle. Los Angeles Mayor Eric Garcetti, who had blamed “senseless gun violence” for the death of 33-year-old Hussle, voiced hope for “justice that Nipsey’s family and community deserve” as the arrest was announced. “Holder walked up on multiple occasions and engaged in conversations” with Hussle, the police chief told journalists. The suspect then “came back armed with a handgun” and fired several times at close range, hitting Hussle in the head and body. “We have a reason to feel hopeful, even in the moments of our most extreme pain,” Garcetti said. “And that’s by turning to each other. “The absolute worst way to pay back Nipsey’s loss — somebody we lost at the hands of violence — is with more violence,” he added. “This is about young people of colour being able to have an opportunity in their lives,” he said. Hussle, born Ermias Asghedom, has been praised by officials in Los Angeles and by his peers for transforming himself from being a gang member to a successful rapper and community organizer who fought for the black and Latino residents of Hyde Park, the South LA neighbourhood where he grew up.